It’s been over a year since I last wrote a race recap. It used to be a pretty regular feature on this blog, but then, you know, pregnancy and baby and adulating got in the way of training for races. It seems only fitting that April be the month of my return to racing and blogging race recaps. Six years ago, in April 2010, I started training for my first half marathon. I was scared to death and thought 13.1 miles sounded like the most insane number of miles to run. You might as well have told me 100 miles. I trained all through the summer and finished my first half marathon in October 2010 with a time of 2:08. I kept running and did some more races over the next few years, and in 2013 I signed up for my first full marathon (recap here). At some point during that 18-week training cycle, a switch was flipped, and running became something I truly enjoyed. I always enjoyed running while I was doing it, but I usually had to talk myself into lacing up my shoes. During that training, I looked forward to my runs and never procrastinated heading out the door. The rest, as they say, is history. 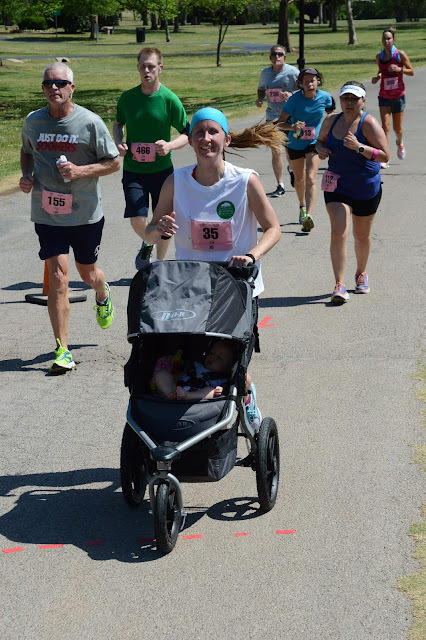 I ran two half marathons while pregnant with R, one at 10 weeks and one at 18 weeks. 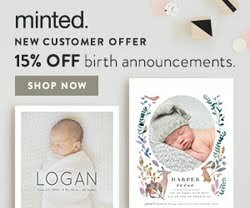 I had signed up for them well before I knew I was pregnant, which is really the only reason I did them at all, but it was nice to have an excuse to keep running. 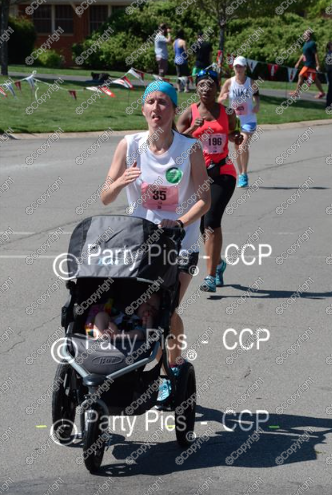 Last weekend, I ran my first race post baby. (You might also like Postpartum Running: An Update.) The Red Bud Classic is a 5k and 10k running event, and this was my third time to run the 10k (2012, 2014, and now 2016). Since coming back to running after having a baby, I have found myself caring less about my pace and time than I ever have. I’m just so excited to be running again that I don’t focus so much on being faster. I also have been so tired with working full time and being a new mom that I want to give myself grace to ease back into it. I have less time to run than I used to, and I take what I can get. Some days all I have time for is a quick 2 miles. Some days I don’t have time to fit in a run at all unless I want to get up at 4:30 in the morning, which I don’t! I am really proud of myself for how far I’ve come in the past 8 months, and it was a wonderful feeling to pin on my bib and lace up my running shoes again. I was really nervous about bringing her for a few reasons, the main one being that I had no idea how she would do. There was an equal chance that she would be fine or that she would start crying a mile into the race and I would have to call Jordan to come rescue us. The farthest I had pushed the stroller was 5 miles, so I honestly didn't know if she would be okay just sitting in the stroller for an hour. My worry ended up being for nothing, because she did absolutely fantastic! She fell asleep for a little bit, but mostly she just sat and played and talked a bit too. It has honestly surprised me how much I enjoy running with the stroller. It is hard work for sure, but I feel like R and I are really bonding when we are out there. I know she doesn't have any idea what is happening, but I like spending time with her doing something I enjoy, and I'm glad I can set a good example for her in terms of fitness and health. Running a 10k with a few thousand participants was very difficult. I started in the back of the race because I obviously wanted to let all the fast runners go first, and so I had to maneuver around the slower runners and walkers pushing the stroller, which was tricky. I didn't want to run over anyone's legs with the front wheel! The good part of starting at the back was that I kept passing people the entire time, and I don't think I was passed much at all except maybe in the last few miles. The run was at 2:00 in the afternoon, and so another problem was that it was EIGHT-EIGHT DEGREES. Thankfully, R was never in the sun very long at all. I kept obsessively checking on her, and there were only a few points on the course where her legs were in the sun, and then it was only for a block or two. I got sunburnt, but whatever. She was wearing just a plain white, short-sleeved onesie and seemed perfectly content to just sit and watch people from her seat. This girl just loves being outside! I did not at all care about my finish time, but I figured if I ended up around an hour, maybe a little over, that would awesome. My official time was 1:00:49, which is amazing! I didn't have my watch during the race (I forgot it at home), and so I had no idea what my pace was or how fast I was running. I tried to take it slow to start off and then gradually get faster as I went on. Run pace: 9:48 min/mile -- I can't believe I ran in the 9s for 6 miles pushing R! 23/94 in my age group and 90th out of 533 females. The last few miles were pure torture, but the feeling of crossing a finish line never gets old. More than my time or pace, more than pushing R in the stroller, more than running hills in the blazing heat, I am just so stinking proud of myself for making it happen. 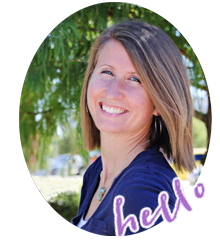 Finding time and energy to run when I'm working a full-time job, being a full-time mom and wife, trying to do housework and stay connected with friends and blog and do my Bible studies... it's exhausting and overwhelming and hard. Really hard. But it's all worth it because these are things that are important to me. And I mean look at that smile. I might have a future runner on my hands! Wouldn't that be fun? I always am impressed to see ladies out in these races with their babies - nothing stopping you!!! Get R used to races & she'll be a pro at riding them out with you. You go, Mama! Very impressive! Congratulations! I have a love/hate relationship with the Red Bud. I love running through Nichols Hills but I hate that the race is at 2 in the afternoon and it is usually so hot! I think this is SO awesome! For so many reasons :) Proud of you for making the time for something you love and so cool that R got to be part of it with you. I'm feeling motivated... well, you know- motivation that I will store for a few months longer haha. I LOVE THIS!!! So impressive and it is awesome to me that you and R did this together. Her first race! And she did beat you technically! Haha. You've definitely got a future runner on your hands. awww she is so adorable! good to hear she did great, but holy moly 2 in the afternoon would be so hot! seriously though, congrats on the race, congrats on continuing to run, whether that is fast or not. you gotta do what you gotta do :) and can i just say you are so nice and considerate about the other runners! i have been run over or hit with strollers before and on one hand i'm like go you for being out here, but could you back up just a smidge, i like my feet haha. seriously, congrats! Congrats! 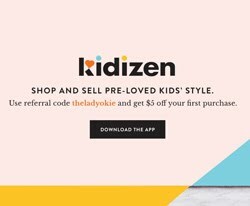 That is great time for pushing a stroller! Several of my family members have taken up running--they always feel bad when any ladies pushing strollers pass them! :) I've run a few practice 5ks or so with them with them, or rather behind them...and I'm sure you would be passing me up too! 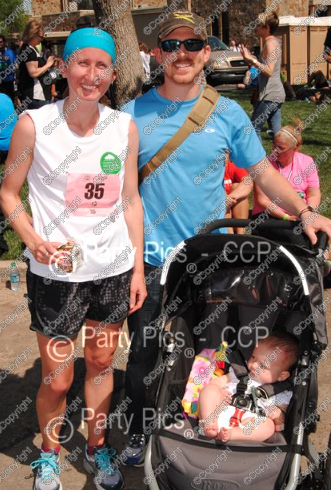 Congrats on finishing your first race postpartum! Just running a 10K was difficult for me when I ran it, so I think that it's awesome that you ran it while pushing R! Congrats mama! It's so amazing that you made this happen, and ran a STRONG race with R in the stroller. I'm so impressed! Also, who has a race at 2pm? That's crazycakes. You are AMAZING! What an accomplishment! I still don't know how you keep up with everything. I am sure it is hard but you seem to do really well. I'm really glad you could take R with you. I think that is super neat and it will be fun to tell her these stories and show her pictures when she is older. Also, your time is really really good! I think it is especially good since you pushed a stroller. That's awesome. You are seriously the most amazing human. I want to high five you and buy you dinner.